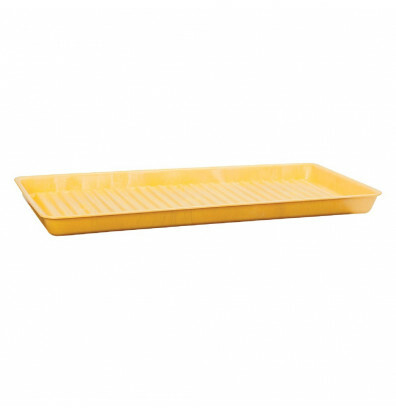 Eagle 1677 spill containment utility tray provides reliable protection for small spills, leaks, and drips. Constructed of durable yellow high-density polyethylene (HDPE) for excellent chemical resistance. Well-suited for countertop use to store lab chemicals, as a drip pan under dispensers, or as a floor tray under machinery. Features a ribbed bottom to help keep containers above spilled liquids. Stackable design saves space when storing multiple tray units together. Spill capacity of 5 gallons.